All-Ways Rigging is recognised as a market leader in the field of Lifting Equipment Inspections, Lifting Slings Inspections, Testing and Re-Certification of Lifting equipment to meet the relevant Australian Standards and maintain statutory records as required. We currently supply this service to the likes of the Mining Industry, Bluescope, Building and Construction, Department of Defence, Councils, R.T.A., Rail Services and Stevedoring companies. 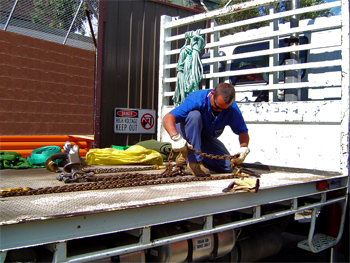 All our Inspectors are Workcover Ticketed Riggers and have had many years experience within the industry. This experience allows us to offer advice on rationalising the type and amount of Lifting Equipment used. This will ensure that inspections can be carried out efficiently and thus be cost effective. We invite discussion with our Inspection Manager regarding interpretation and understanding of the Australian standards in regards to your responsibility in care and use. Any anomalies found during inspections will be reported to your nominated site contact. Repairs can then be authorised and carried out or a formal quotation submitted.